The number of jobs eliminated in the newspaper industry rose by nearly 30% in 2011 from the prior year, according to the blog that has been tracking the human toll on the industry for the last five years. Meanwhile, a separate analysis confirms what most of us already suspected: The proportion of cutbacks was higher in newsrooms than it was for the industry as a whole – twice as high by the calculations I will share in a moment. First, let’s take a look at the surprising surge of job cuts in 2011, a year that many newspaper people had hoped would be a time of relative stability after five years of successive revenue declines. Instead of steadying, advertising sales slid throughout 2011 and likely will come in at less than half of the record $49.4 billion achieved as recently as 2005. As publishers scrambled to bring costs in line with diminishing revenues, 3,775+ newspaper jobs were eliminated in 2011, according to Erica Smith, the author of the Paper Cuts blog. The toll this year is nearly 30% greater than 2,920+ cuts Smith reported in 2010. Smith says “+” because many publishers tend to fudge the numbers when they announce staff reductions. The best Smith can do, as she is the first to admit, is tally whatever hard numbers she gleans from the press – or contained in memos that land in her email. Because many announcements don’t contain numbers, she adds a + to the statistics she assembles. Given this limitation, it is fair to conclude her statistics understate the number of people who have lost their jobs. But the trend she faithfully has been reporting is unmistakable. Since Smith began her running count of publishing layoffs in the middle of 2007, 39,806+ newspaper jobs have been eliminated. This represents 11% of the all the jobs in an industry that, according to the Census Bureau, employed 360,633 individuals in 2007. The worst newspaper layoffs occurred in 2008 and 2009, when, respectively, 15,993+ and 14,285+ pink slips were issued. Newspaper ad sales, the primary source of industry revenues, plunged 17% in 2008 and 27% in 2009, according to the Newspaper Association of America. While the layoff rate dropped to 2,920+ in 2010, things went in the wrong direction this year, as the rate surged to 3,775+ jobs with two weeks left on the calendar (though most publishers presumably will hold their fire over the holidays). With publishers trimming expenses to keep pace with contracting revenues, Smith’s site shows that layoffs hit every level of every department. As in prior years, the positions zapped in 2011 range from senior managers and ad reps to advertising artists and pressmen. Bunches of jobs have been eliminated over the years as publishers consolidated production in shared facilities or outsourced such functions as ad production, call centers and even copyediting and page make-up. Nowhere has the toll been higher than in newsrooms, where staffing has slipped each year since 2005 to successively new modern-day lows. Nearly 1 in 3 newsroom jobs have been eliminated since the number of journalists peaked at 56,900 in 1989, according to an annual survey by the American Society of News Editors. At the end of 2010, only 41,600 scribes were left on the industry’s payrolls. If only a fifth of the cuts identified by Smith in 2011 were in newsrooms, then barely 41,000 journalists will be left at America’s newspapers at year’s end. With the ASNE reporting that 52,600 journalists were on the job in 2007, then the projected newsroom headcount at the end of this year would be 22% lower than it was in 2007. In other words, the decline in newsroom employment has been twice as great since 2007 as the 11% drop in over-all industry employment. 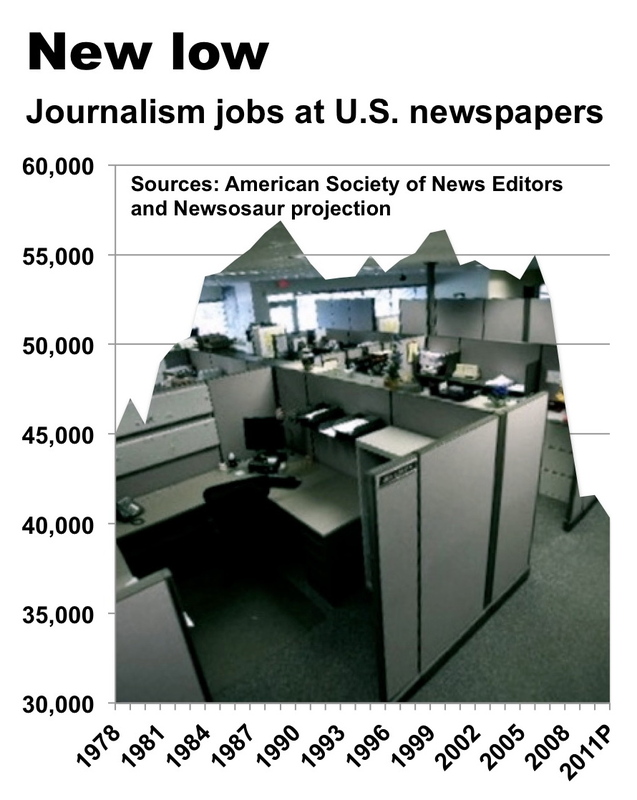 This also means (as illustrated below) that newsroom staffing now is at the lowest level since the ASNE inaugurated its newsroom census in 1978. If I read the chart correctly, newsrooms grew about 24% from 1978 to 1999. Since then, newsrooms have fallen about 28%. Roughly, that means newsroom staffing is 4 or 5 percentage points lower than the base year. During the growth spurt of 1978 - 1999, how many of the newspaper jobs added were reporters and photographers -- the men and women in the trenches? How many were the copy editors, paginators and artists added as production shifted from composing to news? Finally, can anyone seriously make the case that newspapers were better after 1978? Yet the MANY colleges/Universities keep enrolling journalism students without, typically, ANY mention of the HUGE loss of openings in print journalism. Sure, other news-reporting venues are hiring but with an incredible amount of competition for jobs. The colleges want paying customers, students, yet many treat YOU, the student/customer as if you were mere commoners, vermin. Bow down to those "professors on pedestals" if they are even present to teach. So many are off writing a for-profit book or attempting to obtain a grant; all self-serving activities while upper-classmen/women do the actual instruction. In my opinion a sham, a scam, a crime against the taxpayer. I observed the university environment when I attended as a mid-life career changer in my 40s. The younger students did not seem to notice the ongoing schemes, scams, etc. Well, the younguns were a part of the indoctrinated human herd of citizen-sheep. Shed some of the propaganda We, the People, we have been immersed within from birth and observe how too much (but not all) of what occurs in USA colleges is a veritable crime against the people, the taxpayers and the students. John P, I can only speak for Dallas but I believe it's easy to say that the DMN was a far, far better paper in 2000 than it is today and that has a lot to do with the staffing level. and Scott, any young person considering a career ought to do his or her own backgrounding as to the viability of one's chosen path. Is it really the job of the "colleges/Universities" (who is that?) to warn them? Good article, once again. People in the newspaper industry need to wake up and smell the coffee. The old newpaper model is broken. The future of the industry is digi-mobile. Organizing content vertically, revamping customer service to include social media like Twitter and Skype and moving from outbound cold calling to inbound marketing are all three low hanging fruit that reduce and help to generate reenue. Many newspapers have looked past these simple but powerful changes in their operation. Sometimes we can't see the forest for the trees. The future of journalism, in my view, is very bright. What college students need to focus on is building a future news distribution model that can be monetized effectively. Keep writing. Again, good article. The big growth in newsroom employment occurred during a period of rapidly increasing profits, particularly after 1989 but most certainly during the mid-1990s. Some of us middle managers worked like crazy in those years on zoned publications, niche products and custom publications. It was also during this time that readership began to plummet. We saw the anomaly yet newspaper management was powerless to make the adjustments needed to continue the industry's fantastic growth simply because THERE WAS SO MUCH PROFIT IN DOING WHAT THEY HAD ALWAYS DONE. The error, of course, was in not investing in what news would become -- in other words, research and development. For all their "watchdogging" and second guessing, newspaper executives tragically failed to do their job -- secure the future of their industry by making the necessary adjustments. The period of great growth in newsrooms corresponded to a great increase in newspaper profits. Although profits were expanding in the mid-1990s (giving many of us an opportunity to work our butts off on zoned editions and niche publications) readership was declining. Newspaper managers were aware of the trend and worried about it, but with the money rolling in they were not so worried as to actually make preparations for a time when both print readership and ad revenue were gone. They declined to make the hard choices and capital investments that would have prepared them for the future. They read books like "Built to Last" but were too smug to follow the example of foreward-thinking companies and industries. And, yes, if you hadn't already figured it out, I worked for Gannett. @ Scott - I teach journalism as an adjunct at three Chicago-area schools of higher learning (Northwestern/Medill, DePaul and Columbia College Chicago), at the graduate and undergrad levels. All my students seem to arrive with a clear sense of the shrinking job market, particularly in newspapers. But they're also aware that journalism is a big tent, that their skills will have applications in many places beyond print dailies, and that the evolution of the industry is ongoing. There remains a core among them that simply wants to do what journalists have always wanted to do: seek out truth and spread the word, in whatever way exists. And ways will always exist. It's not the journalists fault that the companies they work for have broken business models that rely on ad impressions, which in turn forces them to churn out numerous stories a day. Unfortunately they are the ones that pay for it. PR professionals are trying to help them do their job better by giving them new stories that they can cover - yes, not all of them are news worthy but still enough that they can hit their deadlines. For the lack of coverage though, PR is starting to move into the content creation and social media / community management role in order to increase our reach and go directly to the consumer. And with so many journalists being fired and going into PR, we now have 4 PR professionals for every journalist. Alan D. Mutter is perhaps the only CEO in Silicon Valley who knows how to set type one letter at a time. Mutter began his career as a newspaper columnist and editor at the Chicago Daily News and later rose to City Editor of the Chicago Sun-Times. In 1984, he became No. 2 editor of the San Francisco Chronicle. He left the newspaper business in 1988 to join InterMedia Partners, a start-up that became one of the largest cable-TV companies in the U.S. Mutter was the COO of InterMedia when he moved to Silicon Valley in 1996 to join the first of the three start-up companies he led as CEO. The companies he headed were a pioneering Internet service provider and two enterprise-software companies. Mutter now is a consultant specializing in corporate initiatives and new media ventures involving journalism and technology. He ordinarily does not write about clients or subjects that will affect their interests. In the rare event he does, this will be fully disclosed. Mutter also is on the adjunct faculty of the Graduate School of Journalism at the University of California at Berkeley. Can investors get News Corp. under control?